Those working in the hospitality industry have a responsibility to ensure that anyone who handles food knows the correct practices for handling it safely. All employees should have undertaken the appropriate training to keep food safe and hygienic. 1 in 10 people fall ill every year from eating contaminated food, and 420 000 people die each year as a result (WHO). Without training you drastically increase the risk of food becoming contaminated, which in turn puts the health and wellbeing of consumers at risk, ultimately harming your company’s reputation. Training is especially relevant to anyone working in the Hospitality, Food Manufacturing, and Retail sectors. Food Safety & Hygiene Level 1 Training offers a good understanding of the hazards associated with food and the possibility of food poisoning. It covers contamination, personal hygiene, and cleanliness while preparing food. Whereas, Food Safety & Hygiene Level 2 Training builds on the Level 1 course and provides an in-depth and comprehensive understanding of handling food in the workplace, as well as Food Safety Management Systems and the legal requirements. Why is a Food Hygiene Certificate Important? Food poisoning and ill-health from contaminated foods are one of the biggest concerns with regards to food preparation. Employees should know the three kinds of contamination, understand how food becomes contaminated in the first place, and how to prevent it. Even a small amount of contamination can cause food poisoning and allergic reactions. Food poisoning and allergic reactions are so serious that they can result in fatalities, so ensuring that food is safe and hygienically prepared is imperative. Our training ensures that employees understand the hazards of food preparation and how to prevent food poisoning and allergic reactions from occurring. A reputation can make or break a business and something that can contribute to that reputation is the quality of food served. Customers recognise the efforts of good food hygiene practices, increasing their desire to do business with you. If someone falls ill from food served at your establishment then the likelihood of them returning is seriously reduced, not to mention the bad reviews they’ll tell their friends and family. Zendesk found that 54% of customers share bad experiences with more than five people, while only 33% share their good experiences. Food safety remains one of the most essential parts of food quality control, and far less food will be wasted when your staff is properly trained. This can not only make your kitchen more cost-effective but will also help to improve your reputation as a provider of high-quality food. After so long, it is likely that many employees will question why they have to perform certain activities in a certain way. With food safety training, you’ll be able to ensure that your employees know their responsibilities in more detail, and remind them that they are responsible for the health and safety of their co-workers and customers. Since your restaurant staff are the ones that will actually be handling and preparing the food, it is absolutely essential that they do it in the safest possible manner. This will not only protect customers from hazardous foods but also ensure that employees maintain the best hygiene standards for their own safety. There is no excuse for handling or preparing food in an unsafe manner, and there’s even less of an excuse to serve this food to customers. Although time and poor training are often used as reasons for poor service, this cannot be continued in any kind of hospitality or culinary establishment. Employees need to understand, in-depth, why food safety is essential and the only real way to do that is through effective food safety training. This training is not optional, but rather, a necessity. Employees are going to need (Level 2) Food Hygiene Certificates in order to prove their knowledge and reinforce the importance of these culinary safety standards. Equip your staff with the essential training that allows them to handle food with a knowledge of good safety and hygiene practices. 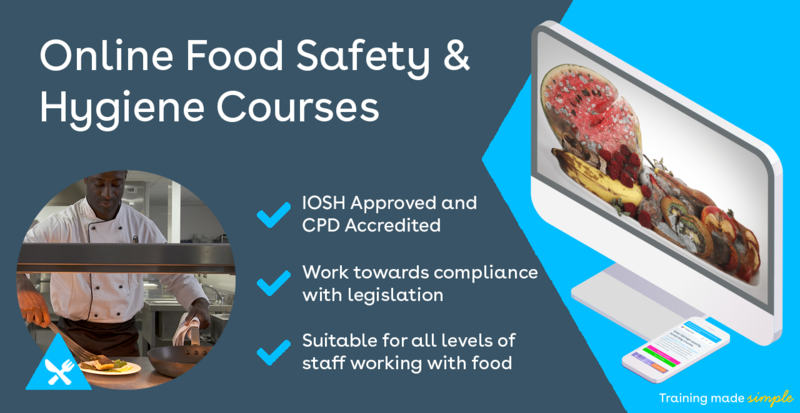 Learn the signs of food poisoning, all about record-keeping, and food safety procedures with our CPD Accredited & IOSH Approved Food Safety & Hygiene Training.